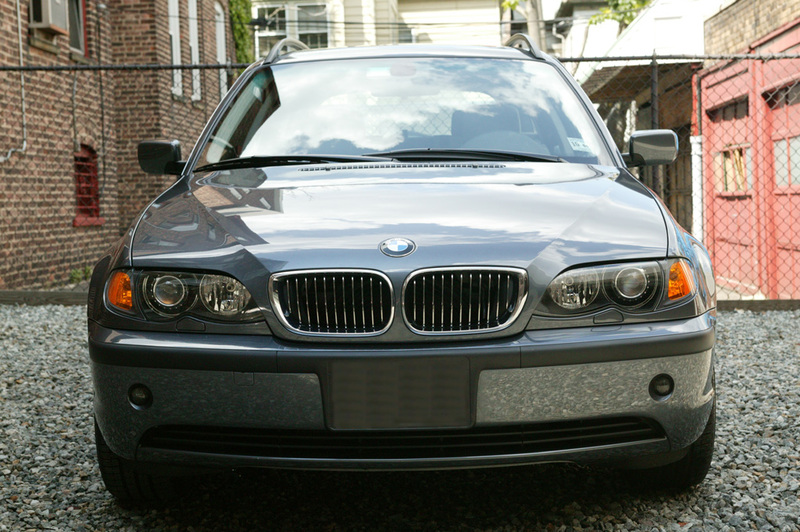 This page was started on October 5th, 2002 when my new BMW came home for the first time, and has been updated since as I made various modifications to the car over time. I'm also using this page to point out some things that I get asked frequently, like GPS diagnostic mode and the location of the AUX input. The mods got off to a slow start, since BMW apparently used my particular car for practice in learning how to apply the 2003 model year wiring changes - I've had a number of oddball problems which have hopefully all been corrected. Some people ask why I paid the dealer for options I could install myself. I wanted to get the full warranty (dealer-installed options at the time of car purchase carry the same warranty as the car, while options added later have a shorter warranty). Given the problems I had with the phone when I first got the car, it was a good thing I made this choice. 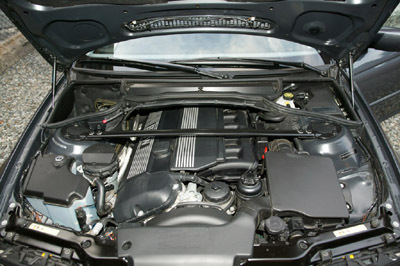 Diagonal view of the car. It looks bigger than the Talon in this picture, but it is only 4" longer and 2" wider (and yes, I've gotten a lot of humorous comments about that). The view from the front. This isn't called the "head-on view" for the same reason that no car manufacturer offers a color called "Lemon Yellow". Here is a slightly different view, taken in June, 2003. The car has been washed, clayed and has 2 coats of Zaino Z-2 on it (the previous pictures were in the dealer-supplied wash & wax). Here is another side view. 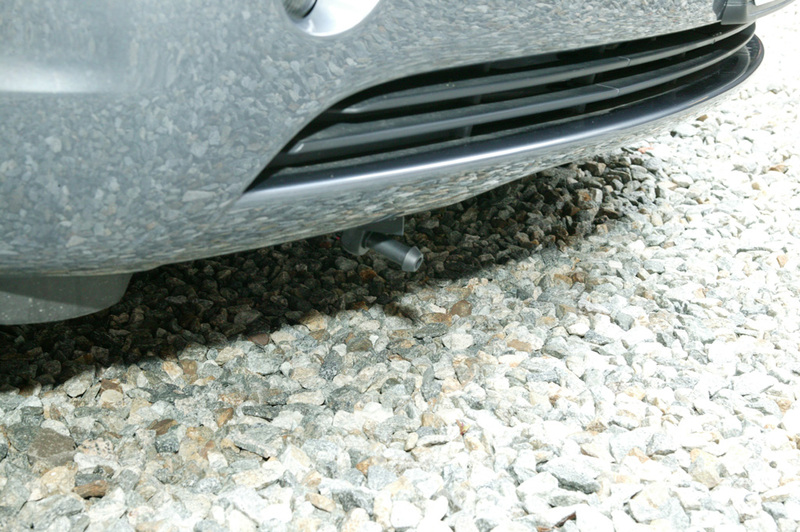 In this shot you can see (if you look carefully) that the front and rear mud flaps have been installed. 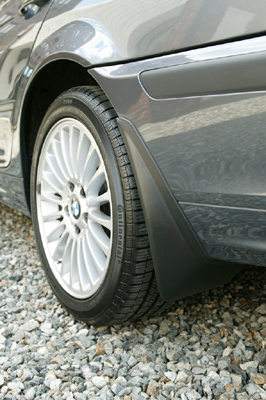 Mud flaps seem to be one of those things people either love or hate, with no middle ground. I bought them when I picked up the car, but held off installing them for the first 7,500 miles or so. After driving on some dirt roads in Illinois, the fenders were so splattered (particularly in the rear) that I decided I needed the flaps. 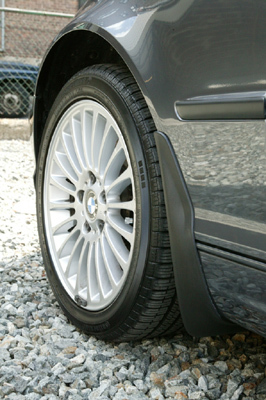 They are very subtle on a darker colored car, like this Steel Gray Metallic. This shows the rear mud flaps, looking toward the back of the car. Here we are looking at the rear mud flaps again, but this time facing the front of the car. After bending a wheel on one of our wonderful NYC crater-potholes, I discovered that a replacement tire+wheel costs about $600. I decided that the $20 or so investment in wheel locks would be a wise choice. While I don't park on NYC streets that often (I'm lucky enough to have a garage), it would be just my luck to come out and find the car up on blocks. 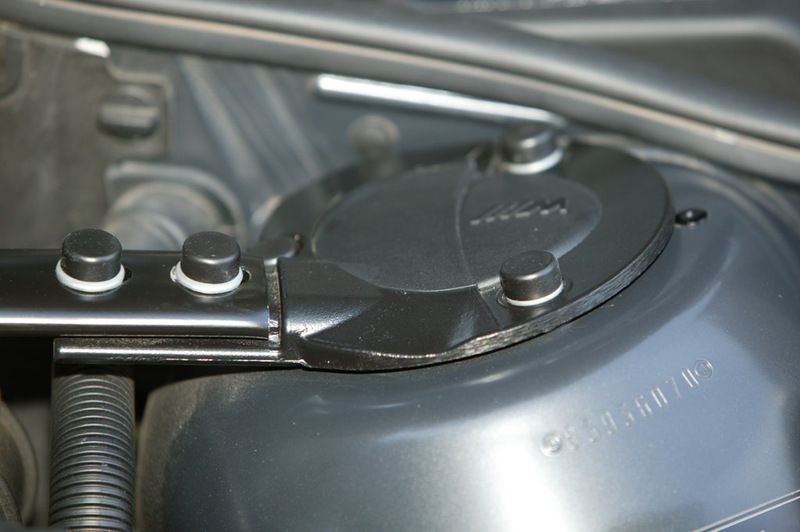 The wheel lock is under the black plastic cap at the 1 o'clock position. It is a simple spline key, but should be enough to keep the local miscreants in line. 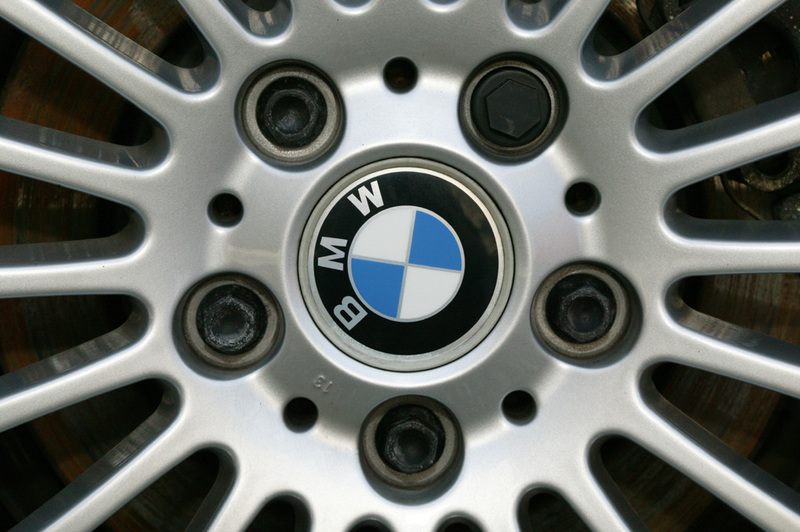 There's nothing quite like having a flat and discovering that neither you nor BMW Roadside Assistance have the key to your wheel locks. 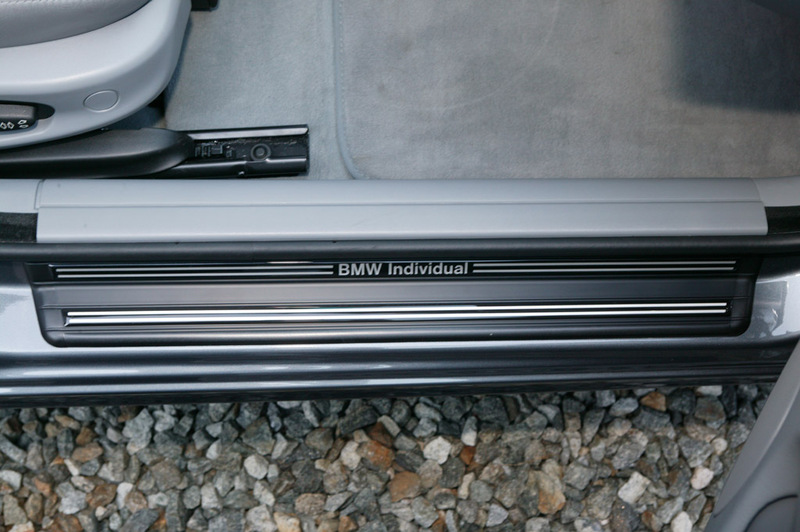 Not to worry, BMW thinks of everything - you get 2 "keys" with a set of locks, and there is a pre-molded spot for one of them in the trunk tool tray, next to the lug wrench. The second one sits in my garage tool box. 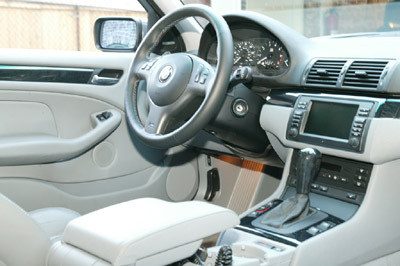 The inside of the car. The steering wheel swap hasn't been done yet in this shot. 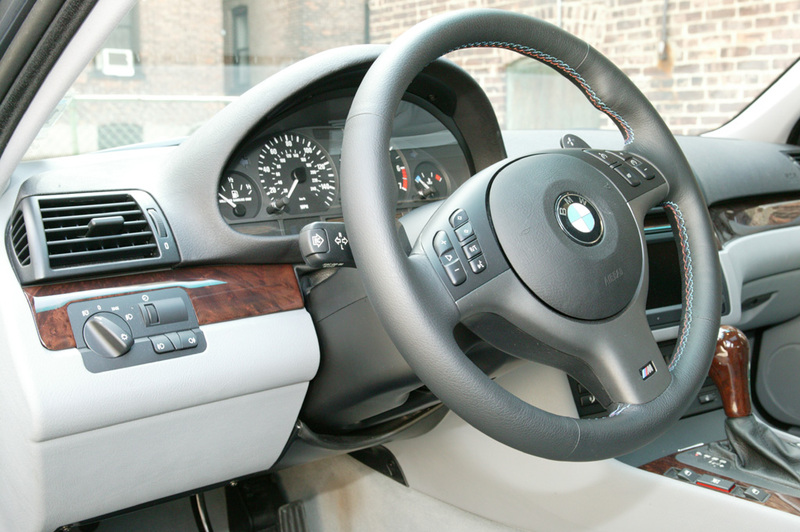 The text that says "20.10 BMW" visible on the center console is the combination GPS navigation/on-board computer/radio control/phone control/optional TV. The "20.10" was displaying because this was one of the first 2 weeks of the 2003 model year production and the final software wasn't ready yet. Now it just says "== BMW ==". 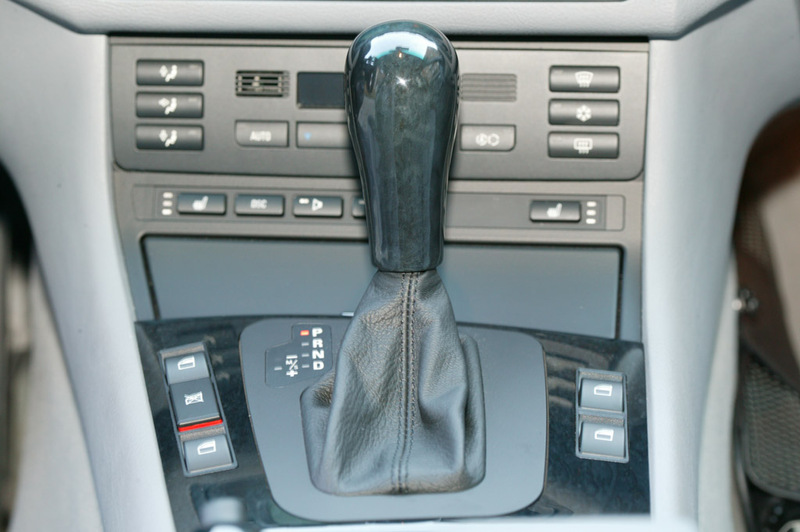 Yes, the car is an automatic, but it offers a pseudo-stick (clutchless manual) mode, and when I get the steering wheel changed, I'll be able to shift using the steering wheel. You can see the phone/radio/CD/cruise control buttons on the steering wheel. 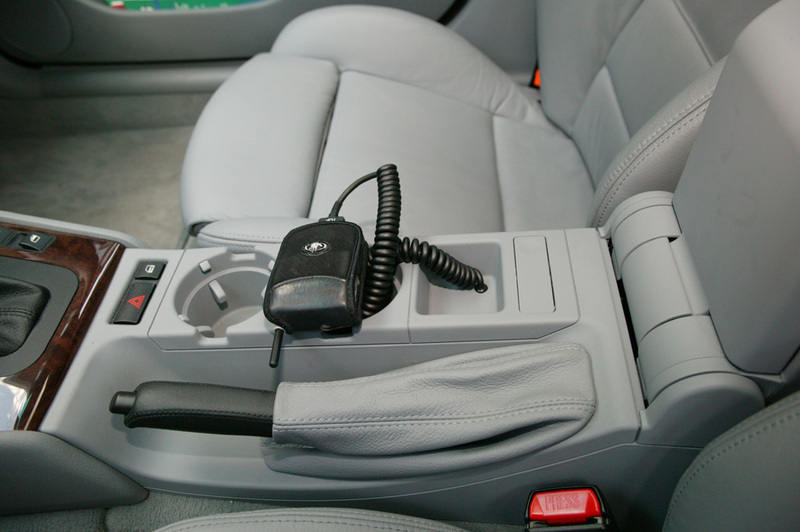 Note the cell phone holder (called the "eject box") between the driver and passenger seats. We'll come back and discuss that later on. In this photo from June 2003 you can see that a number of things have changed - the headlight switch on the left has been changed (more on this later) and there is a new steering wheel. This is the M3 SMG steering wheel which has "-" and "+" flippers on the wheel (you can see the "+" flipper peeking out above the right side cross-spoke on the wheel). As I mentioned above, these flippers can be used to shift gears in manual sport mode. The wheel is also slightly smaller in diameter, has much more padding, and has comfort grips at 10 o'clock and 2 o'clock. 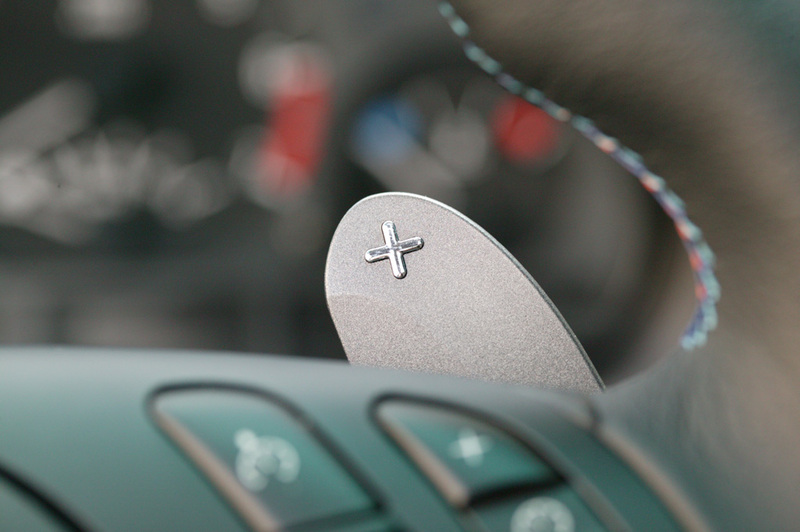 Even if you don't care for the shift paddles, it is definitely a worthwhile addition to a non-M 3-series. In fact, BMW offers it as an option (code 710) in Europe, but not in the US. 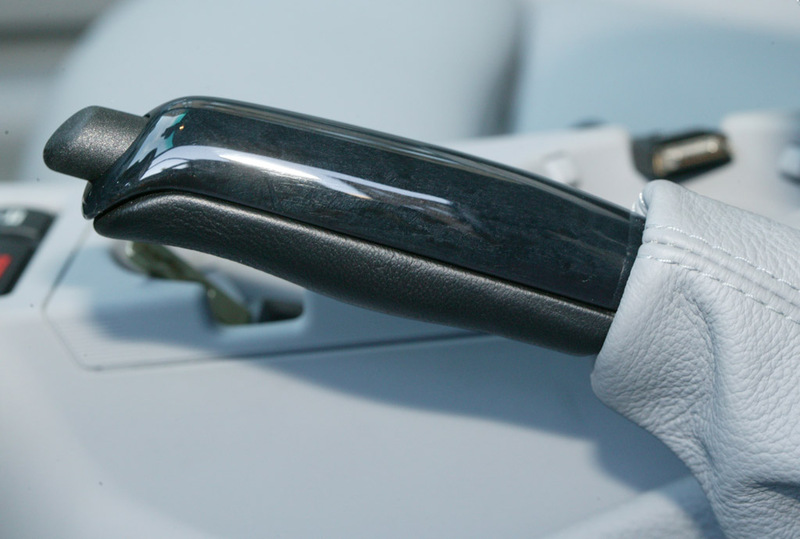 Here is a close-up view of the "+" shift flipper on the steering wheel. Just like a F1 race car (almost). Non-US BMWs get rear fog lights. 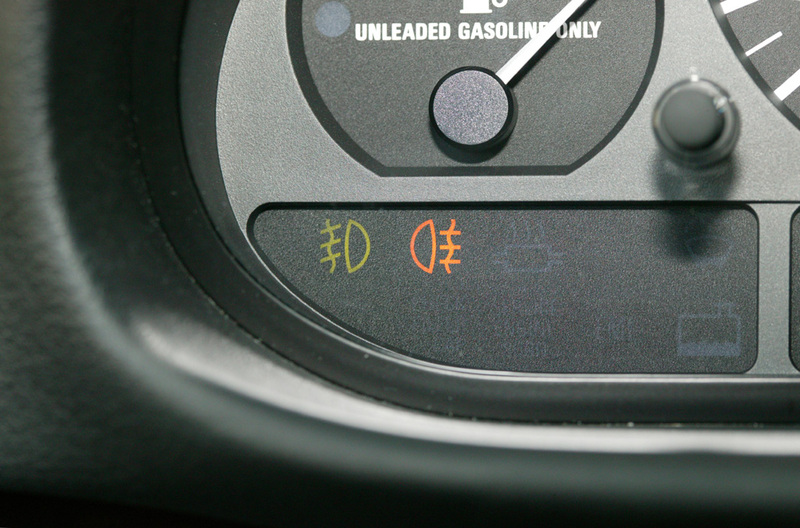 However, since the US is full of people who drive around with their fog lights on all the time, BMW doesn't include rear fog lights in US BMWs. Fortunately, it is possible to order the non-US light switch module, which comes with an extra button for the rear fog lights. 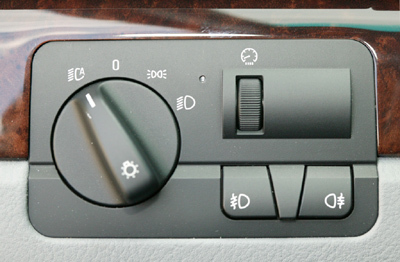 This happens to be a convenient switch for just about anything, since when the switch is activated, you get a display on the instrument cluster showing that it is on. I'm using this to operate an electronic deer whistle. What, you may ask, is a deer whistle? It is an electronic gizmo similar to those ultrasonic "pest repellers" you see advertised for the home. The idea is that the deer will hear the noise and look to see what it is, instead of leaping out in front of your car. I have no idea if it is actually effective or not, but the company that makes it will pay the insurance deductible if the car hits a deer, so at least they think it works. I hope it does, since on the 800-plus mile trip to Amanda's there's a dead deer every few miles. As I said above, a light illuminates on the instrument cluster when the fog lights are turned on. The green light is for the front fogs and the yellow one is for the rear fogs (deer whistle in my case). This is the actual deer whistle, mounted under the front bumper. There are very specific requirements for the mounting angle, and this is the only place that works on a BMW (besides, snaking the wire through the engine compartment was quite a chore!). I expect that sometime over the life of the car I'll crunch this gizmo on a bumper strip, but hopefully not for a long while. In my previous car (a 1995 Eagle Talon TSi AWD) I had a large fire extinguisher and EMT first aid kit, as well as a 4 D cell Maglite flashlight. But the Talon had bins in the trunk which could hold all of those without any problem. 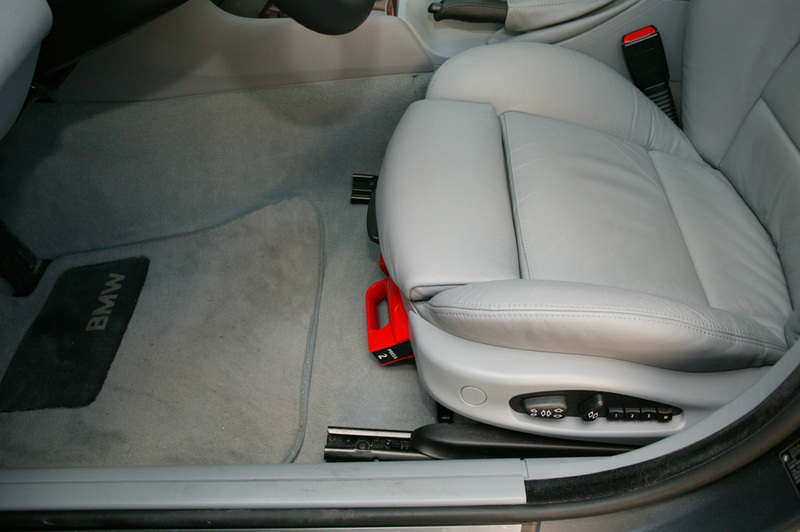 The BMW has a cleaner interior without convenience bins like that. 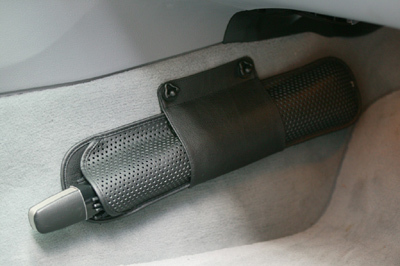 Fortunately, BMW provides a small rechargeable flashlight in the glove box, and European models also get an under-seat fire extinguisher and first aid kit. Again, they don't trust us Americans with the good stuff. While these are smaller than the ones I had in the Talon, hopefully they will be sufficient if I ever need them. The fire extinguisher is pretty obvious under the driver's seat in this picture. However, with the doors closed and in normal light, it isn't really that obvious. By comparison, the first aid kit under the passenger's seat looks invisible. The contents are like a large folding map - once you open it, you'll never get it folded back up correctly. However, if I ever need it, that will be the last thing on my mind. 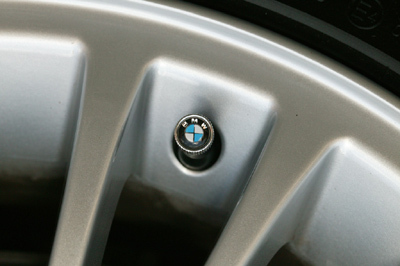 There are all sorts of "creature comforts" available as options on a BMW. For example, you can buy a hanger to hold a suit from the headrest to keep it from wrinkling (no, I didn't get that option!). One of the options I did get was this convenience umbrella. 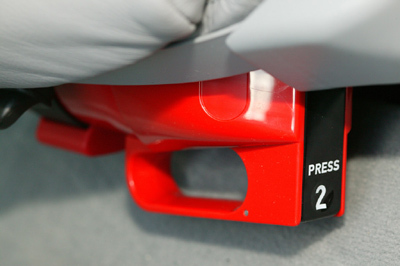 The somewhat unusual angle is specified in the installation manual - BMW doesn't want it popping out and injuring someone in an accident or other sudden stop. 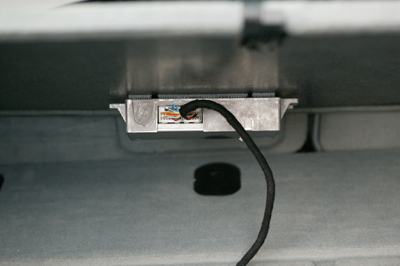 Up in the head liner, between the moonroof switch and the cell phone/voice input microphone, is a universal (learning) garage door opener. In the Talon I had one of the openers that clip on the visor, and it didn't work very well - I had to be right next to the door for the opener to "hear" it. This universal opener has a much greater range - the opener will react to it when I'm halfway down the driveway. Very convenient - the door will be fully open by the time I get to it. It can control up to 3 different doors or other devices. No sports car would be complete without a radar detector, though these days the main things it detects are those annoying "Road construction ahead" signs. This is the Valentine 1 unit, probably the best on the market today. 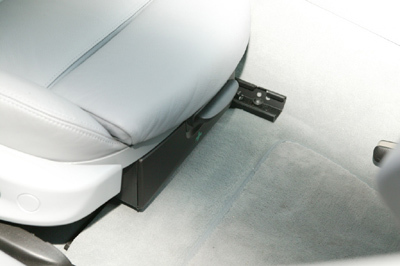 When not in use, it is stored in the rear armrest, where it fits perfectly. I leave the armrest down anyway, since I find it obstructs my vision when it is upright. The case on the seat behind the armrest is a large CD carrying case - this is where I kept my CDs before I installed the PhatBox MP3 player (described below). A view of the luggage area. It is huge, which is one of the reasons I picked this model. 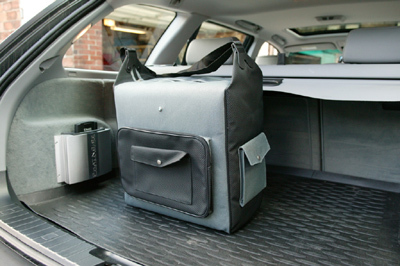 I was never happy with the trunk in the Talon (though part of that was that Bozo the Eagle Dealer put the CD changer on the floor in the middle of the trunk). The seats fold down (60/40 split). 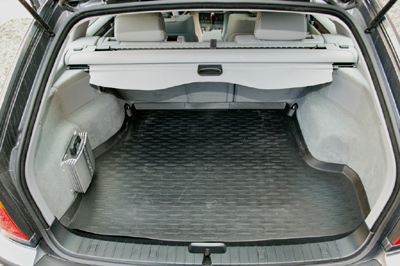 The rectangular shape in the middle is for transporting skis, though many people take that out and install a subwoofer there. I'm undecided. The hanging flap is the cargo cover, so people outside can't see what you have in the trunk. It also has a netted screen which can roll up to the roof from either where you see the flap, or all the way from the floor to the roof, for transporting (for example) cats. 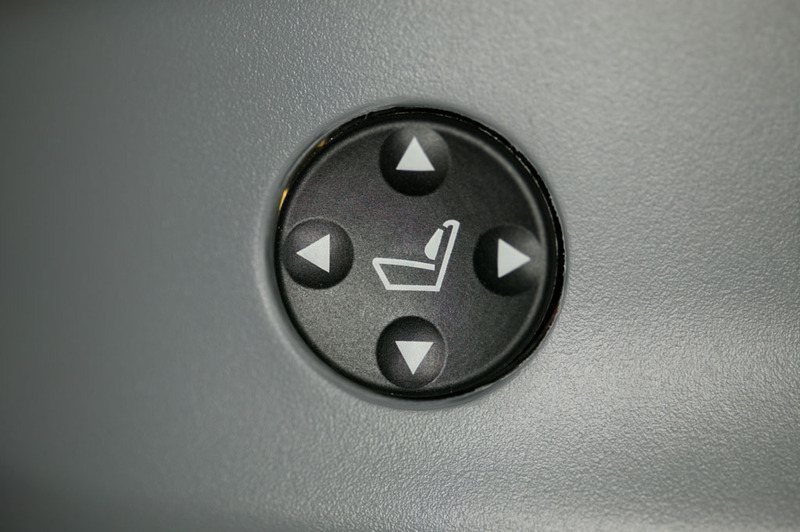 The odd-looking thing in the center is the center armrest - the two black circles are cup holders in the armrest (the cover is partially open for some reason in this picture). In this newer view, you can see the PhatBox MP3 player in the silver case on the left (more on this later) as well as a plastic floor liner. This liner is removable - it just sits on top of the "mouse fur" carpet shown in the previous picture. It is very handy if you're the kind of person who gets asked to go pick up potting soil, plants, etc. Note that the standard trunk floor panel has a leatherette "pull tab" to grab onto when you need to lift the floor panel to get to the tools, spare tire, and so forth. This pull tab has a plastic clip on it which is supposed to hook on the lip of the hatch to hold the panel up. It is quite easy to mis-hook it and grab (and rip) the rubber weatherproofing gasket instead. Also, when you put the mat down, there will be a large bump where the mat sits on top of the clip. You could put the pull tab and clip under the floor, but that defeats the purpose. I removed the plastic clip piece but left the pull tab - it isn't that thick and doesn't interfere with the floor mat. 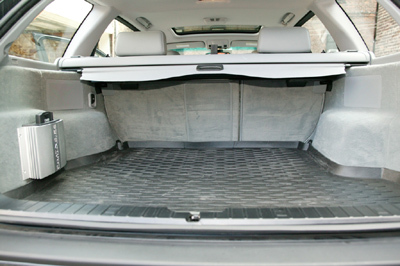 This is a slightly different view, which should give you an idea just how huge the luggage area is in this car. Of course, with the rear seats folded down, it gets even bigger. 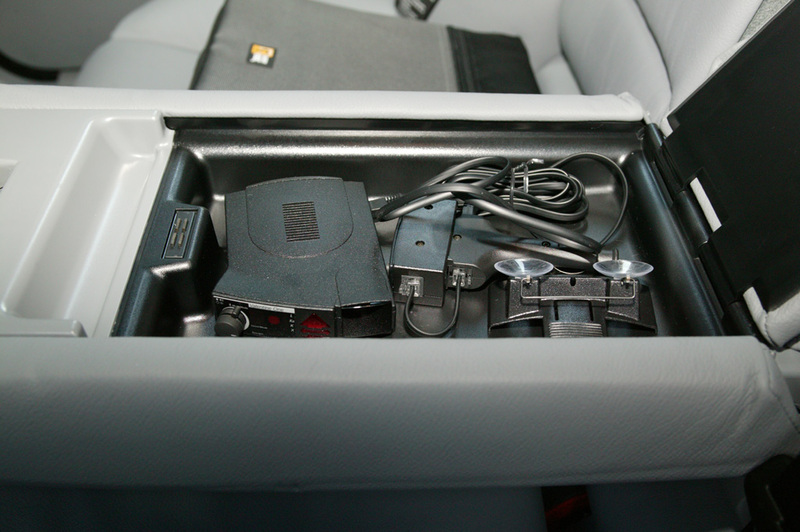 One of the other convenience features is the "BMW Cool Box", an electronic cooler for the trunk. This uses the same Peltier Effect technology as some sophisticated microprocessor heat sinks - electricity produces cold when run through the device in one direction, and heat if run in the reverse direction. 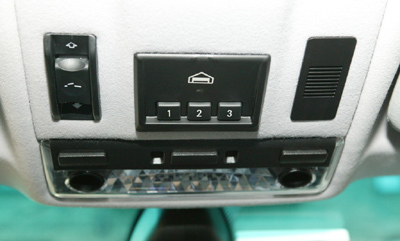 There is a second cigarette lighter outlet in the trunk for this gadget. My dealer had never heard of this BMW product when I ordered it and they ordered a second one for display purposes. Since then they've been selling one or two a month. This is the interior of the left fender well. 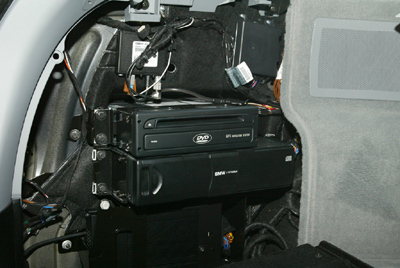 In there are the DVD navigation computer and drive, a 6 CD changer, and one of the stereo amplifiers. 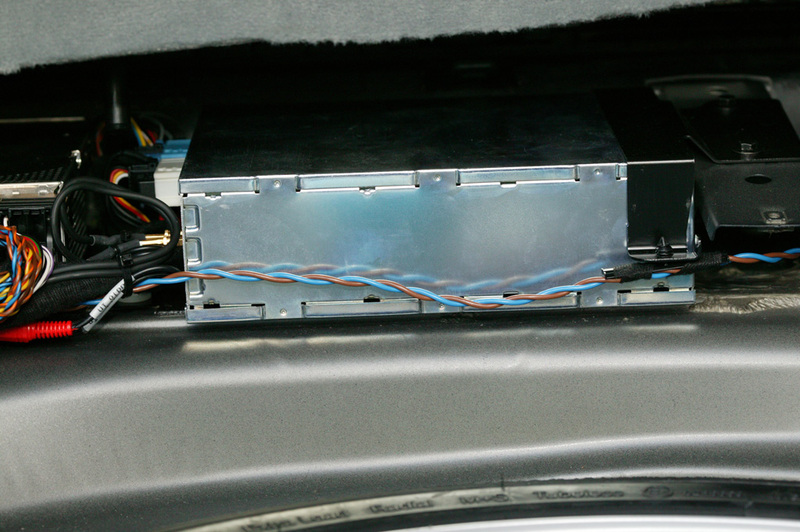 You can't see it, but the voice input module is behind the panel to the right of the CD changer. All of this is concealed behind a flap in normal operation. I'm not too thrilled with having to open the compartment to change the CD magazine. 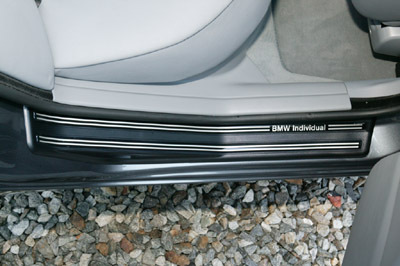 This is a unique misfeature of the Sport Wagon - all the other versions of the 3-series have a door in the flap so you don't have to disassemble the car. However, now that I have a PhatBox MP3 player, this is not a problem any more. In this newer view, you can see the BMW warning triangle in a blue box. This is yet another safety feature available in European BMW models not offered in the US (do you see a pattern forming here yet?). It took me a while to figure out where exactly it was supposed to mount in there - space is very tight as we'll see in some subsequent pictures. You may also notice that the CD changer has been evicted from its spot below the navigation computer. This is the PhatBox MP3 player which has replaced the CD changer. One 60GB DMS cartridge holds over 800 CDs worth of music (MP3 encoded at 192Kbit/sec VBR). Currently, 3 cartridges hold our entire music collection. I had ordered a spare trim panel (the piece the PhatBox is mounted to) when I was planning to add my own hatch for access to the CD changer. Since I never got around to that, I simply re-used it for this application. Space is really tight inside the compartment behind the trim, and it wasn't possible to mount the PhatBox in there, so I decided to mount it on the outside face of the trim panel. Of course, if you have a player that can hold over 800 CDs, you need more than 800 CDs to put on it. As it happens, I have an earlier project for just that purpose. Click here to browse the CD collection. If you're interested in some "behind the scenes" views of that hardware presented in a style similar to this page, click here. I am also a developer for the PhatVoice program which generates improved voice prompts for the PhatBox. 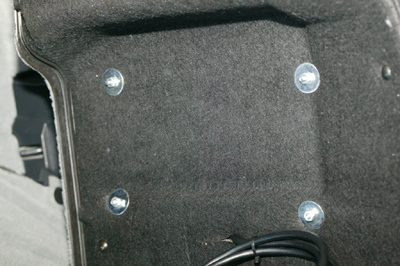 I drilled 4 holes in the trim panel and used fender washers to keep the nuts from pulling through the acoustic padding on the inside of the panel. I cut a slot in the panel under the PhatBox, extending a little bit below the lower edge of the unit, to fish the cable through. 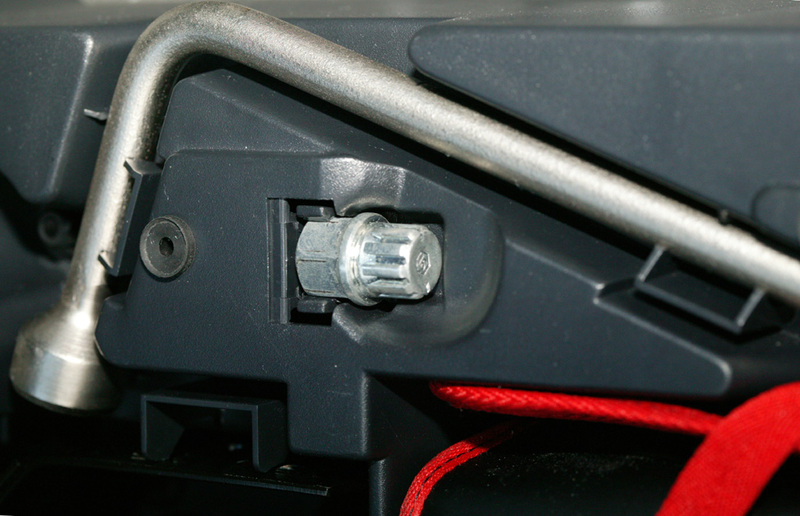 Here you can see the PhatBox cable connecting to a Blitzsafe adapter (which comes with the PhatBox). 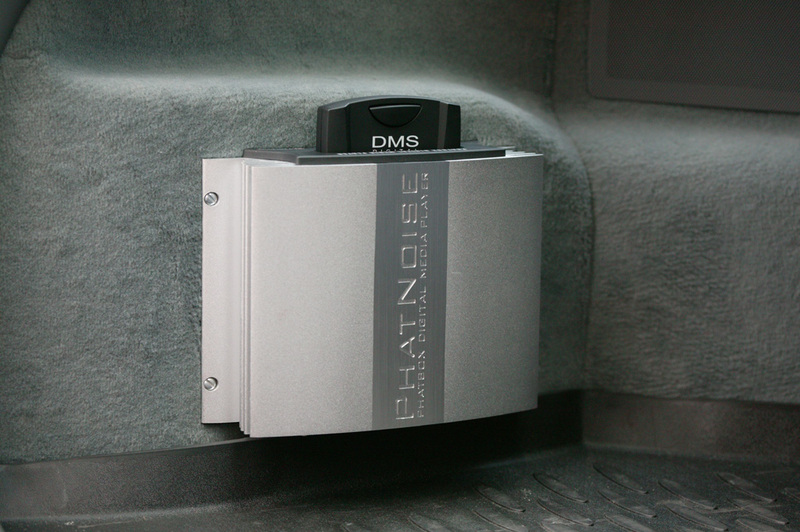 The Blitzsafe converts the PhatBox's Alpine-style language to the BMW's i-bus. 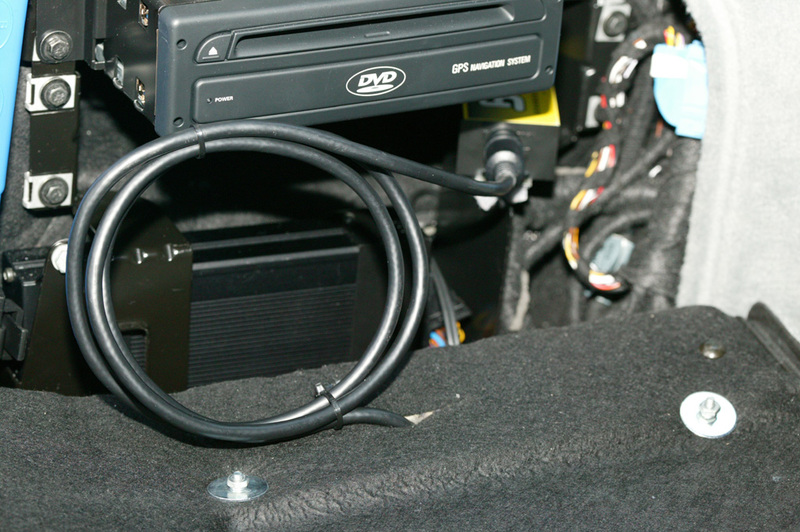 When the trim piece is reinstalled, the cable sits in the empty space where the OEM CD changer used to mount. Of course, with nearly 2,000 CDs worth of MP3s in the car, knowing what is where is essential. While the PhatBox speaks artist/album/song titles, it is still handy to have a list of what is in there. This printout lists all 2,072 (as of March 2004) CDs stored on the 3 PhatBox DMS cartridges, in alphabetical order. The numbers on the right-hand side are index numbers which match the information displayed on the NAV screen (each CD shows up as a track on the CD screen). Rather than waiting for the PhatBox to speak each name, knowing the numbers for "where you are" and "where you want to be" lets you push the track up/down buttons that many times rapidly. 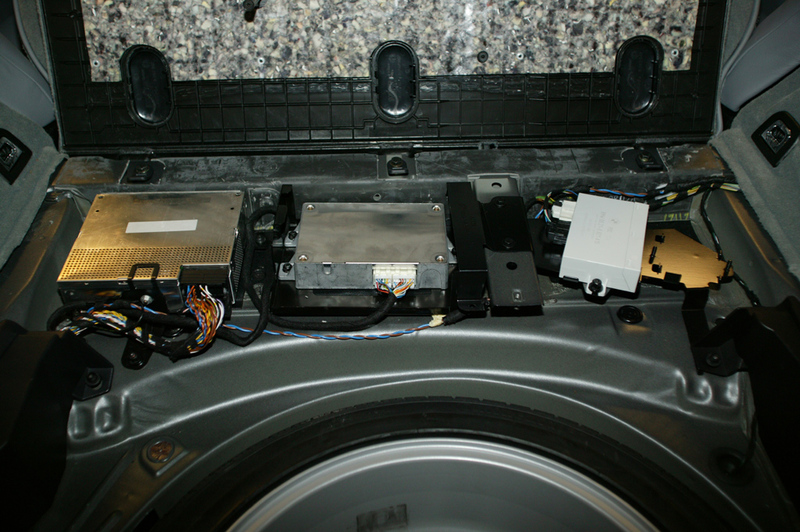 This car is just full of electronics, hidden in every possible nook and cranny. From left to right, these are the radio tuner, the telephone control module, and the park distance control unit. Unfortunately, the TV tuner is supposed to go where the telephone control module is. I needed to relocate the phone module (fortunately, it has a long cord). The only vacant position in this area is on the far right, which would be the electronics module for the trailer hitch (everything on this car has electronics in it!). Unfortunately, that spot isn't big enough for the phone control module. The next picture will show what I did. 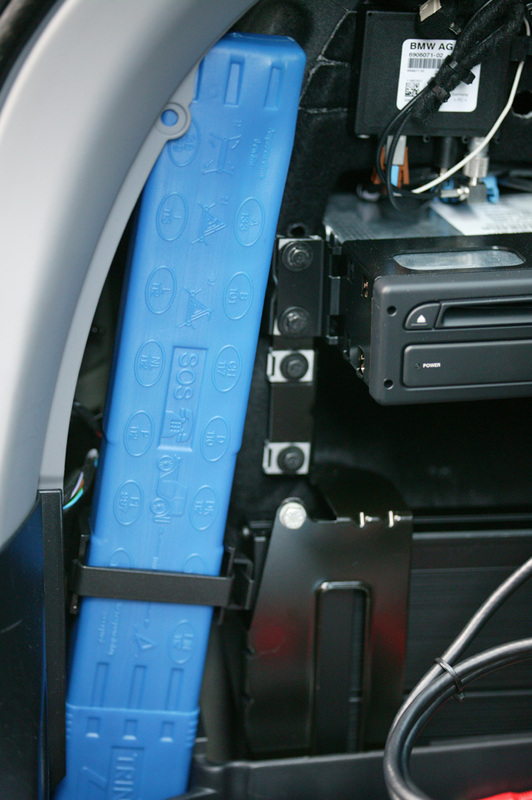 I used Velcro to attach the phone control module to the underside of the trunk floor panel. There are about 3 inches of clearance between the top of the spare tire and the bottom of the panel, plenty of room for this module. With the space used by the phone control module freed up, the TV tuner was installed. 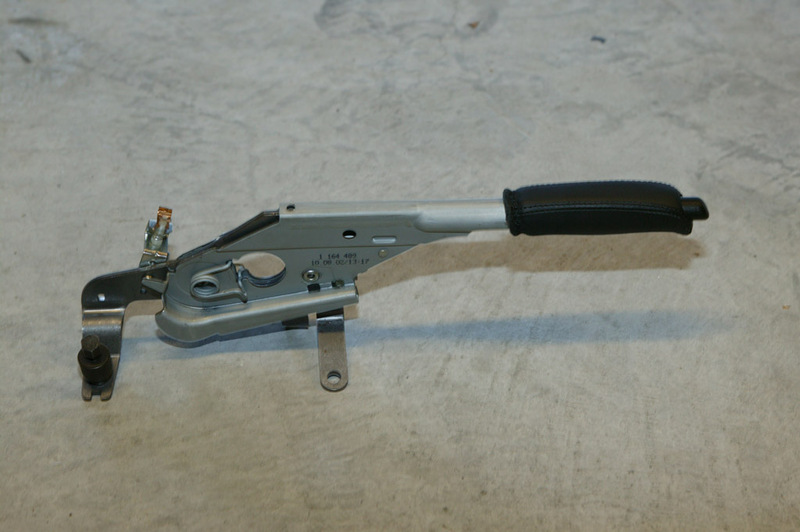 This involved removing the rear bumper and most of the trunk trim to run various wiring harnesses and to attach the antenna to the inside of the bumper. The red connector at the left edge is one of a set of audio/video inputs and outputs. 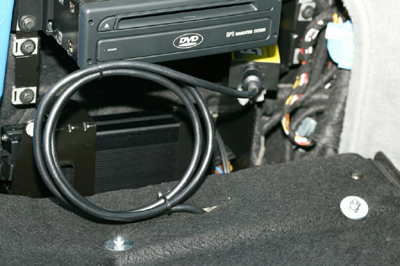 I have a DVD player that connects to the other end of these cables (behind the trim where the PhatBox is mounted, though I might install a connector panel on the trim later on). The TV tuner is yet another European option not available to US customers. You have to import the module yourself. A minor annoyance is that it comes set to German TV standards, which means that the picture rolls and is un-viewable. 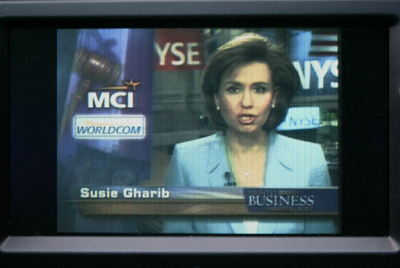 Unfortunately, the on-screen menu to change to US TV standards is superimposed on the un-viewable picture, so you have to change it by trial and error until you get a stable picture and can see what is going on. 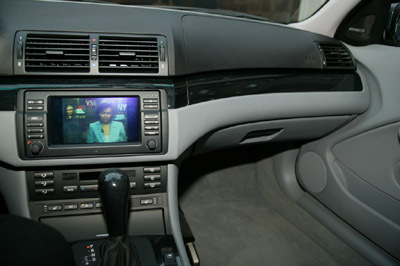 And here is the end result - TV on the navigation screen! The picture actually looks a lot better than this - you're seeing an interaction between the car's LCD screen and my digital camera, exacerbated by down-sizing the image for the web. 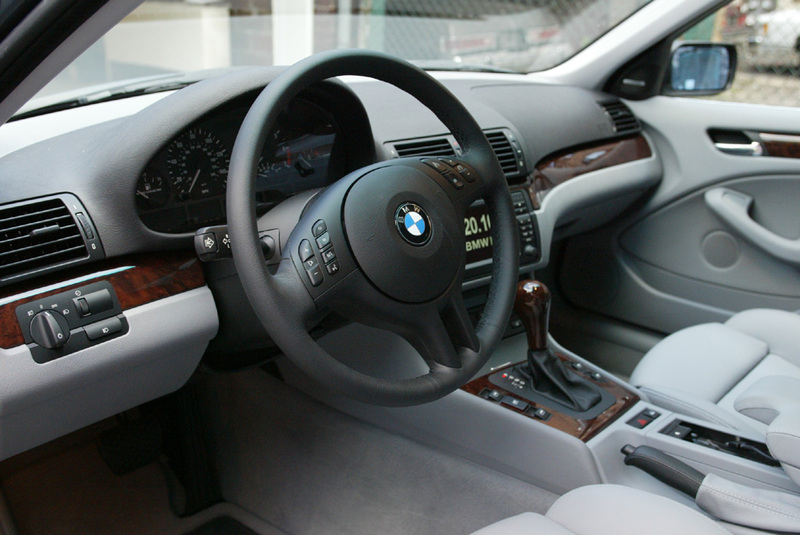 When the 2003 model year BMWs were announced, it was stated that they would come with an auxiliary input for things like portable music players, satellite radio, etc. However, BMW changed their plans and decided to offer the input as an add-on option (rumor has it that this is because the kits weren't ready at the start of 2003 production). Retrofitting this kit is a challenge, particularly on a car with the navigation system. It requires disassembling the dashboard and using tools not available except at BMW dealerships to remove the display screen. I detailed my experiences doing this on a number of BMW message boards. 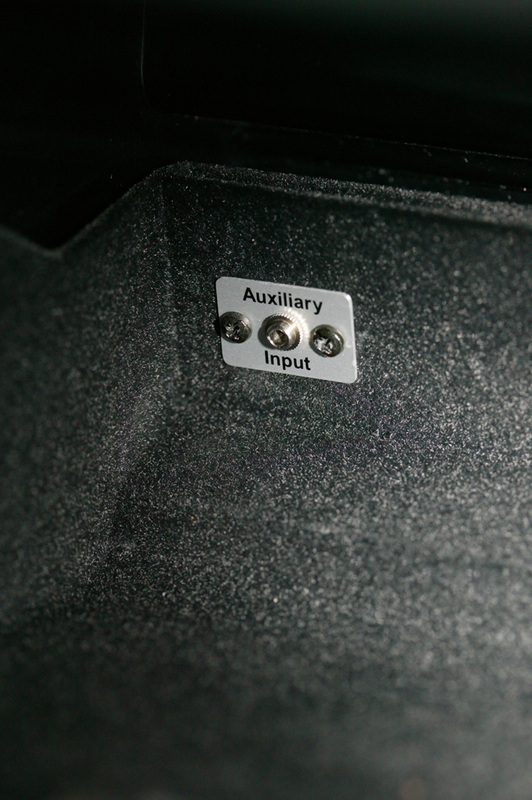 This picture shows the end result - the Auxiliary Input connector inside the glove compartment. 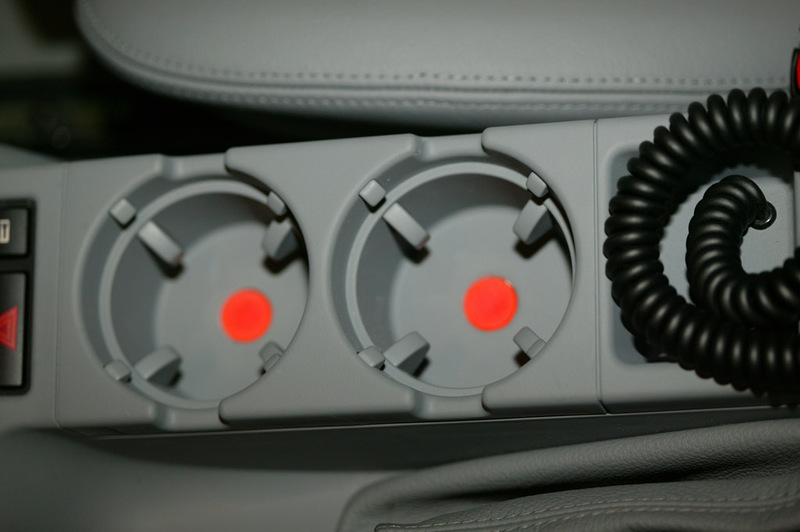 Some people have said that the connector faceplate is huge, but it isn't all that big and it has to be this size to clear the unusual grid pattern molded into the back of the glove compartment. Since there is also a connector for the rechargeable flashlight in the glove compartment, you can actually put a complete portable music player in there and close the door. Or you can route both power and audio cables out through a pre-cut slot in the door frame if you prefer. 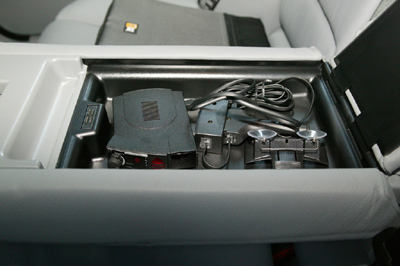 After driving the car for a few months, I decided that I didn't want to sacrifice the cupholders and coin dispenser for the cell phone insert (called the "eject box" by BMW). Unlike the generic Motorola hands-free kit for these phones, the BMW kit doesn't require the phone to be in the eject box for it to work - as long as it is connected by the coiled cord, the phone can be anywhere. So I ordered the coin dispenser and cupholder inserts and modified the coin dispenser's utility tray to have the coiled cord for the phone come up through the tray. The circuit board for the eject box is insulated and sits under that tray. This is the real BMW cell phone kit, not just a charger cable - it is just modified to not have the eject box taking up space. Here's a picture with the phone attached. The cable is a bit long - I may decide to shorten it somewhat. On the other hand, due to the way the phone interacts with the car, picking up voicemail requires dialing from the phone handset and listening to the earpiece, so perhaps the longer cord is fine. 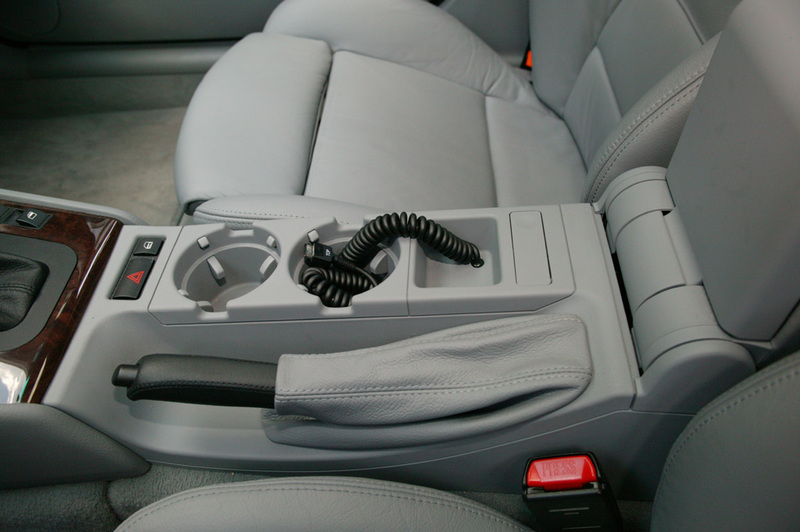 With the center armrest in the lowered position, you can just see the phone peeking out. And there is still one cupholder available for beverages. Almost all of my modifications to the BMW have been to install BMW parts that aren't available to US customers. 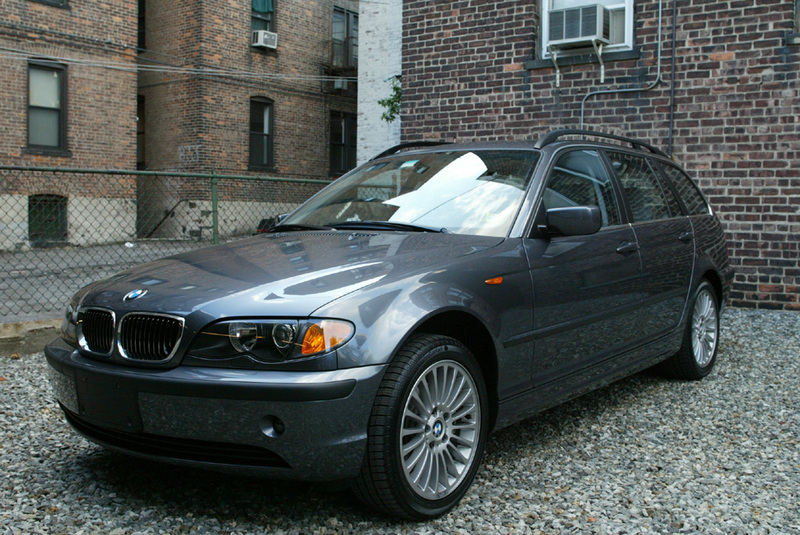 The only things I've added that weren't pure BMW are the deer whistle and PhatBox MP3 player. Later, I decided that the car could use illuminated cupholders to make it easier to see where they were while driving and trying to put a beverage in them. Fortunately, this is a relatively easy DIY project, which I have fully documented here. This picture shows the end result. 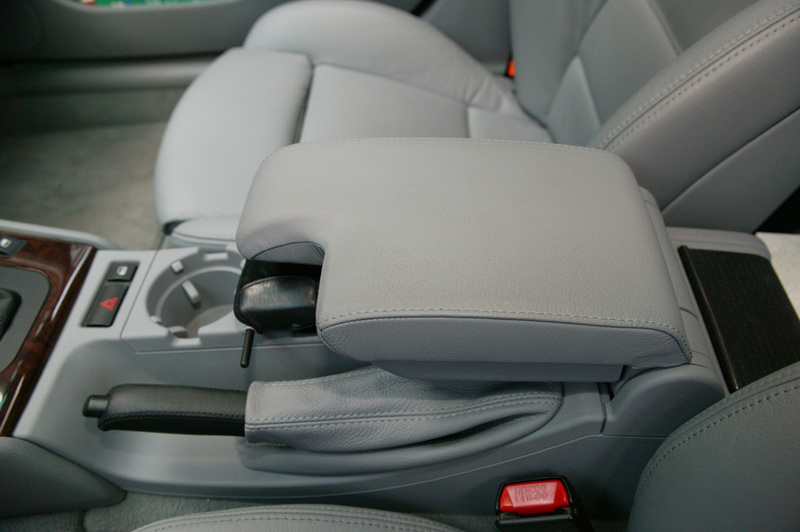 Note that the actual appearance is a bit more subtle - the armrest is usually down and you won't be staring at them head-on through the moonroof. Due to the mutant potholes (there is actually a "pot-bump" that is about 12" high and growing in the middle of the intersection of Trinity Place and Church Street in Manhattan) and generally awful roads in the NYC area, I decided to add the M3 strut brace to prevent the car from flexing and going "flubba-flubba" as it went over (or around) them. This view shows the whole engine compartment with the brace between the towers. A number of people will say that you only need this brace if you do high-performance driving (autocross, etc.) 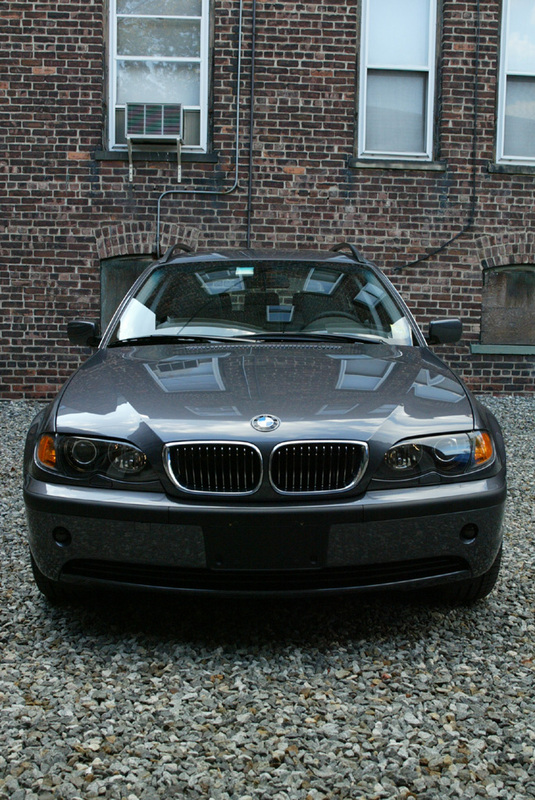 - I can tell you that it makes a definite difference just driving on NYC streets. Here is a detail of the driver's side tower. Note the scuff marks on the left and right sides of the right-hand nut on the actual brace bar - this is from the sideways motion of the bar over road irregularities. 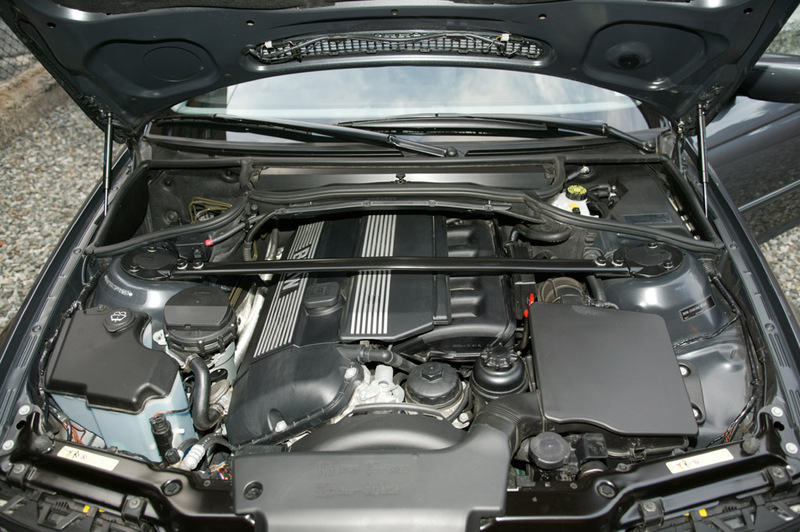 Here is an "art" shot looking across the engine compartment. 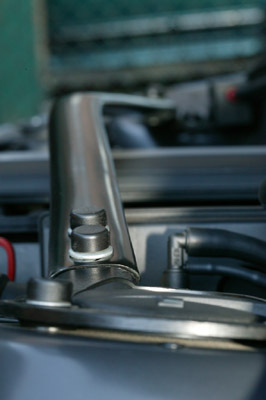 The bend in the middle of the brace is to clear the engine. This is the "aspherical" mirror glass (also called the "split mirror") which is either an option or standard in non-US markets. 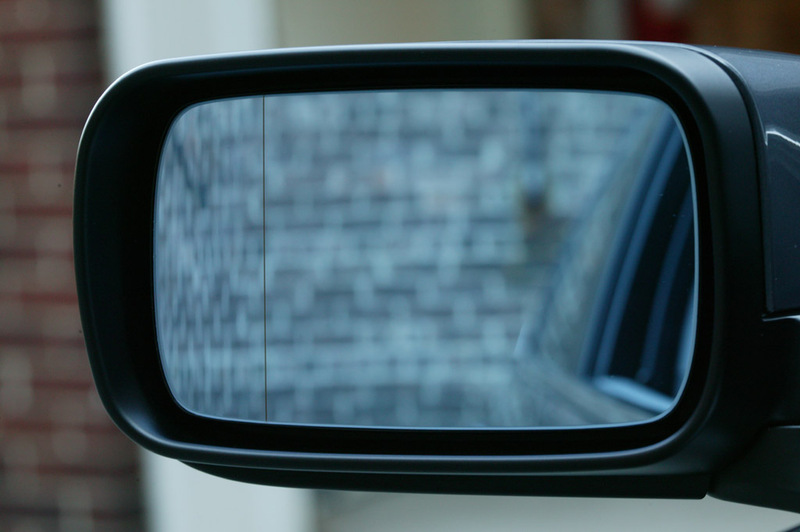 The smaller section to the left of the vertical line is slightly curved, so you can see the cars that like to hide in your blind spot. You can see how the bricks in the mirror look "compressed" on the left side of the line. 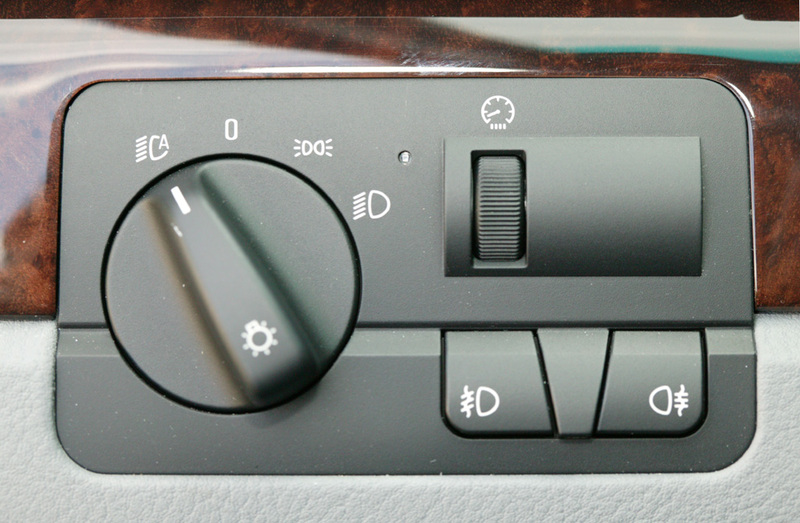 Again, outside the US there is an option for "power folding mirrors" which lets you fold the mirrors in at the touch of a button on the mirror control switch. In the US we just get manual folding, where you have to give the mirror housings a good yank to fold them in. I upgraded to the power folding version on both sides of the car. 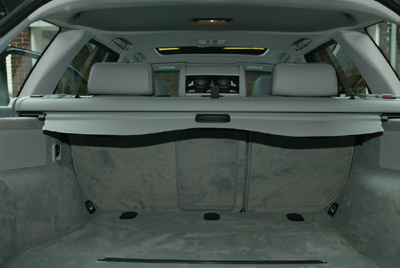 This involves a near-complete disassembly of the doors, as the mirror control unit is inside the door and the wires snake over, under, and around the door insulating foam. While I was in there, I also fixed the rattles from the door speakers. The mirror shown in the previous picture is the folding version, but you can't tell the difference from looking at it. 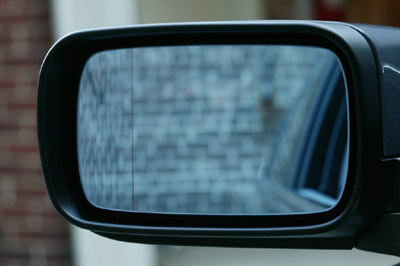 These mirrors look just like the non-power ones - in fact, you re-use the painted trim pieces from your old mirrors. 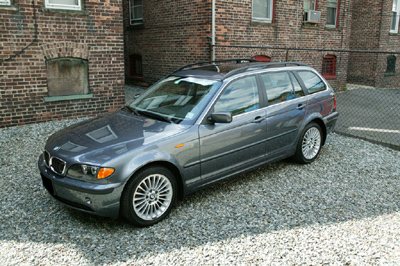 I like these mirrors more than the oval M3 ones, at least on the wagon. 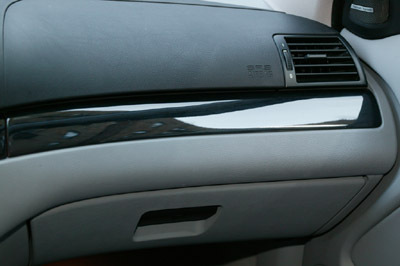 The switch on the driver's door handle is replaced with one having an additional button to fold/unfold the mirrors. I don't have a video showing the mirrors folding - yet. 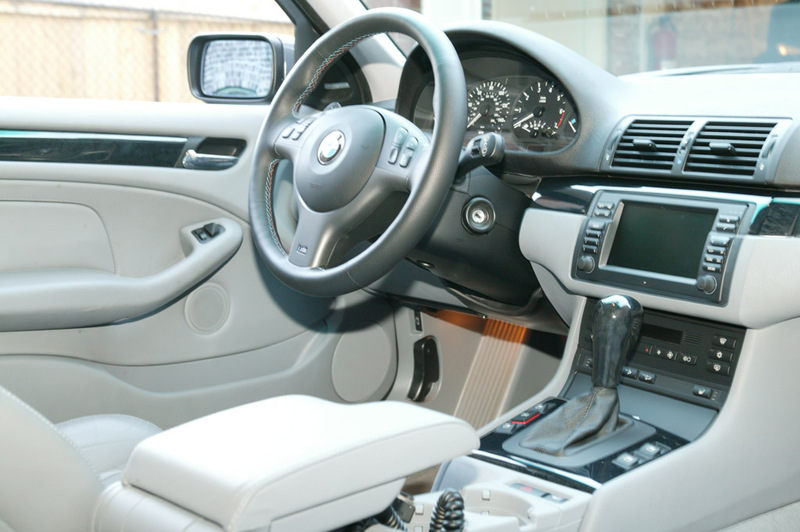 BMW offers a program called BMW Individual where you can order custom paint and interior colors, custom trim, and (depending on the car model) things like cigar humidors, intercoms, and video monitors in the seat headrests. This program isn't available in the US (though some people have been able to order the Individual paint and leather options - it seems to depend on what sort of mood both their dealer and BMW NA is in at the time). While I love the Steel Gray exterior and the gray leather interior, I was never wild about the Myrtle wood trim - the brown color (which you can see in the earlier pictures here) didn't go well with the interior. Since the dash is a two-tone assembly of black and gray, I decided to order the Birch Anthracite trim. This isn't available here in the US and needs to be imported from Germany. 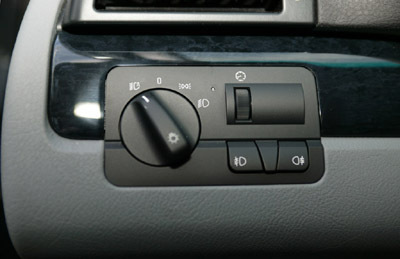 On the wagon, there are 10 pieces - three on the dashboard, one on each of the four doors, the shift knob, shifter surround, and handbrake handle. This wood is very hard to photograph well, as it is an extremely dark wood with a very subtle grain, and it has a mirror polish on it (which you can see in this picture). Here is a closer view of the passenger side diashboard trim. Note the mirror-like reflection on the wood trim - that is a reflection of the apartment house next door, through the passenger window. Here you can see some of the grain of the wood trim. As I said, it is very subtle. 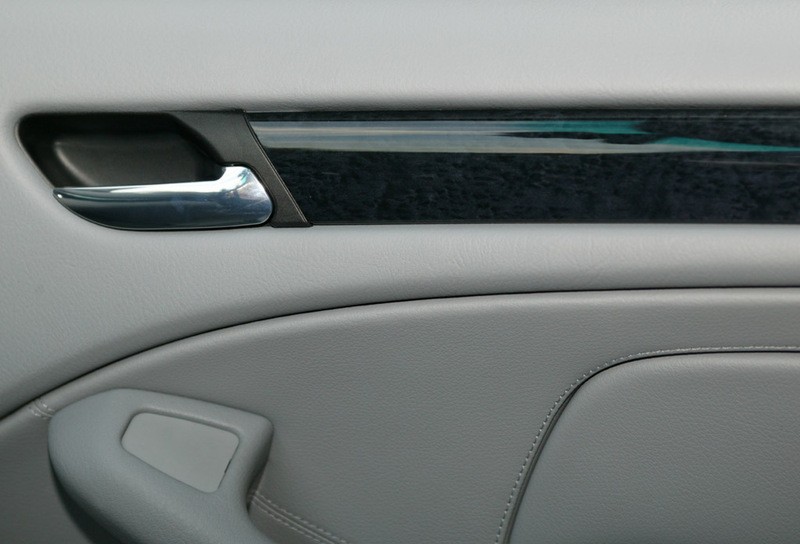 It becomes more obvious in low light situations - I was amazed when I first installed the trim and looked at it at night, lit only by the car's interior lighting. The black trim on the doors carries the two-tone dash styling throughout the passenger compartment, and makes a number of the black items (such as the rear ashtray and cup holders) look like something that was intentionally color coordinated instead of things BMW decided to only make in black to reduce costs. 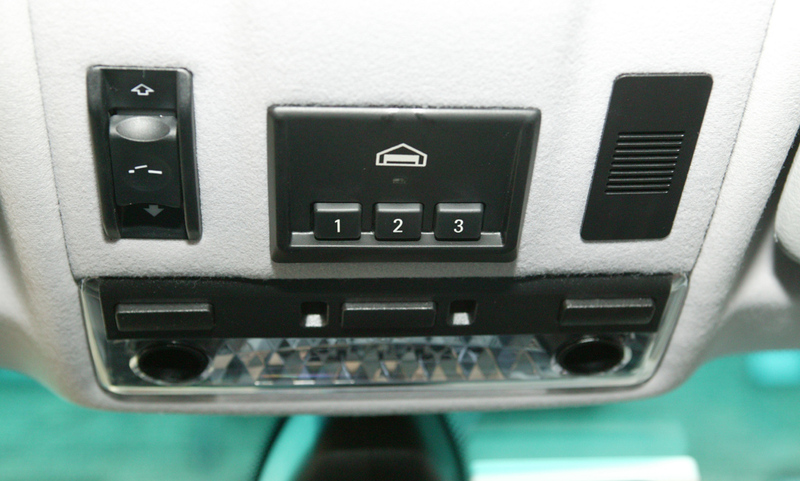 This is a close-up of the light control module on the left side of the dashboard and the trim surrounding it. It also shows the wood grain nicely. 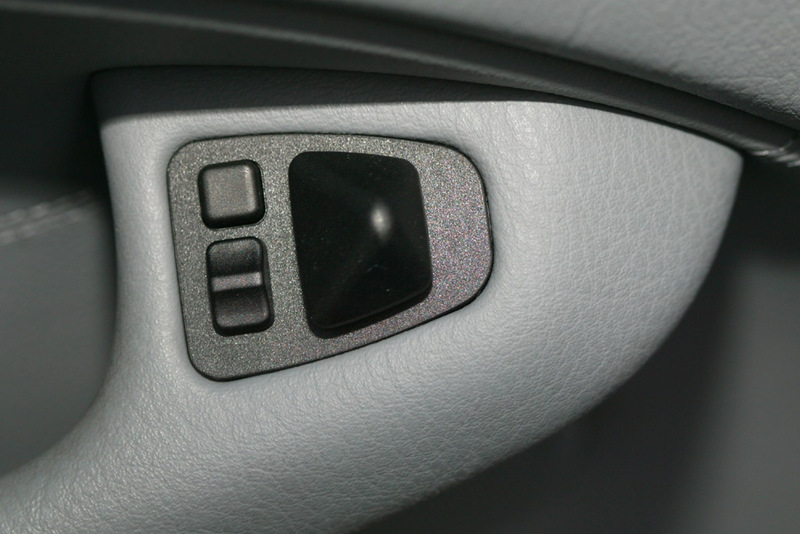 This trim is really dark - in this picture of the shifter, the climate controls, ashtray, and the shifter boot and trim are actually black. 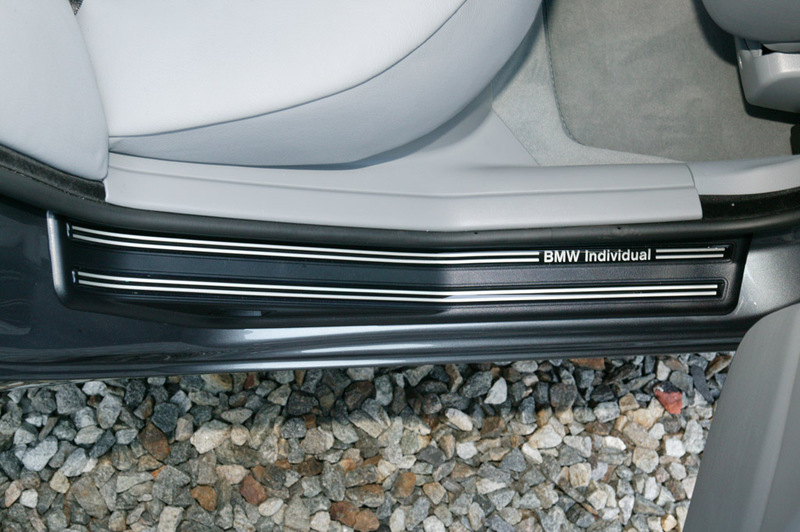 Note how much darker-than-black the Birch Anthracite trim appears. Here's a wider view of the interior. You can see many of the installed trim pieces in this picture. Here is the old handbrake assembly after it has been removed from the car. You can see the leather surround which wraps around the whole handle. Note that the round black object on the front left of the picture isn't part of the brake assembly - it is just a weight I used to keep the assembly level while I was taking this picture. 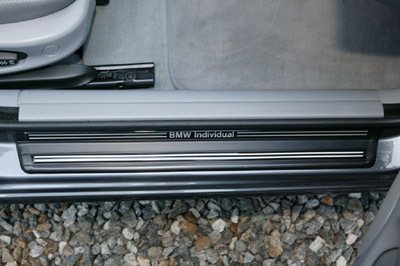 One of the perks that comes with a BMW Individual car are door sills that proclaim the car to be an Individual car. Since I added the trim, I decided to add the door sills as well. 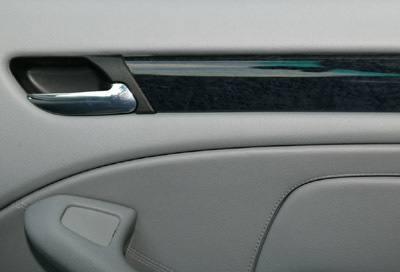 This is the sill on the front passenger door. And here is the rear one. 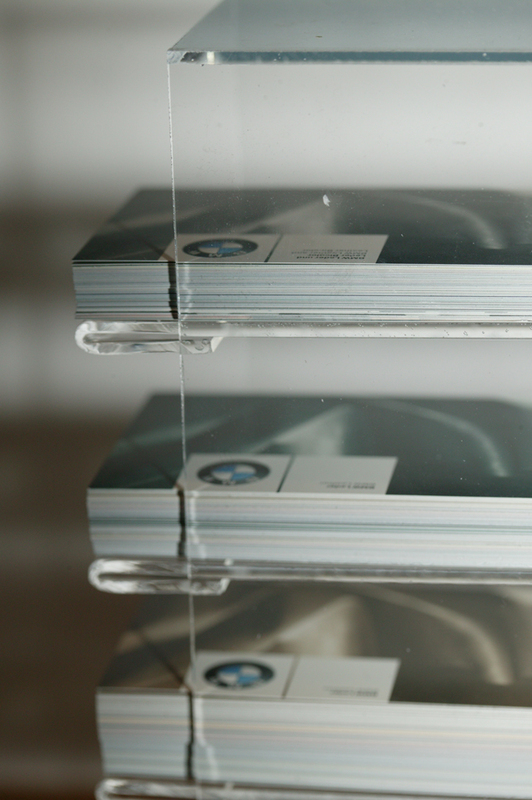 The BMW Individual Program covers an amazing variety of items, not just paint and trim. You can see some of the options at the BMW Individual web site. 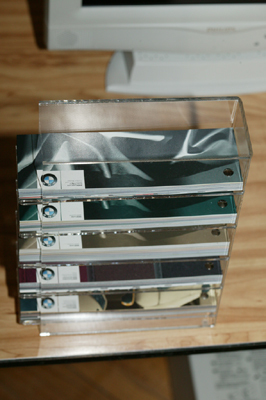 This picture shows the sample box for Individual interiors as well as exterior trim mouldings. Each card set has from 50 to 100 cards (one per color) in it. The top 3 card sets are just for the leather options. 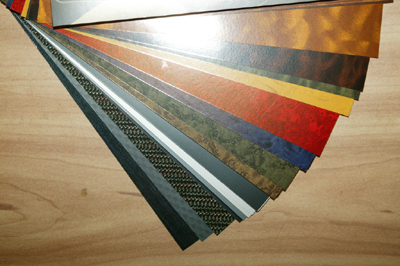 The next card set is for floor mats (mat color, edge band color, stitching color and style) and exterior mouldings. The bottom card set is for interior trims. Here's a close-up of the sample box. This is the cover for the interior trim card set. 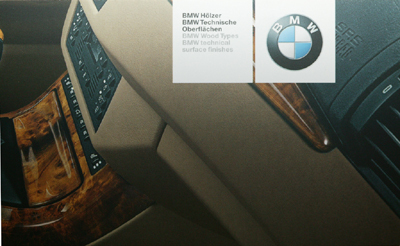 It says "BMW Wood Types and BMW technical surface finishes". This is the same card set as in the previous picture, fanned out to show some of the samples. 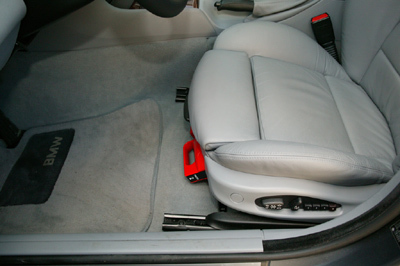 In the fall of 2003 I added the lumbar support option to my front seats. This picture shows the switch on the side of the seat that controls the amount of support. Pushing the top of the switch inflates the upper pad, the bottom of the switch inflates the lower pad. Pushing the front of the switch inflates both pads and the rear of the switch deflates both pads. The complete installation instructions are here. I've answered a number of questions on various BMW message boards regarding the GPS diagnostic functions and how they relate to things like a dead battery, moving the car with the battery disconnected, and so forth. To get into diagnostic mode, go to the "Settings" screen on the display and press and hold the "Menu" button for about 15 seconds until the screen changes to diagnostic mode. This picture shows the first "sensor check" screen. Note that it is reporting 7 visible satellites and a known position. This picture shows the GPS status screen. On it you will find all the data sent from the satellites or computed by the navigation computer - the current latitude and longitude, and the computed altitude (if in 3D mode - see below). I had been informed that the "Altitude" display during regular navigation system operation was from topological data on the map CD/DVD, not from the GPS satellites, but experimentation shows this to be false, at least some of the time. As an example, driving across Manhattan on 34th Street from Dyer Ave to the Queens Midtown tunnel, the reported elevation varied by over 1000 feet! You'll also see the date and time in UTC, and the current ground speed and compass heading (we're standing still in this picture). 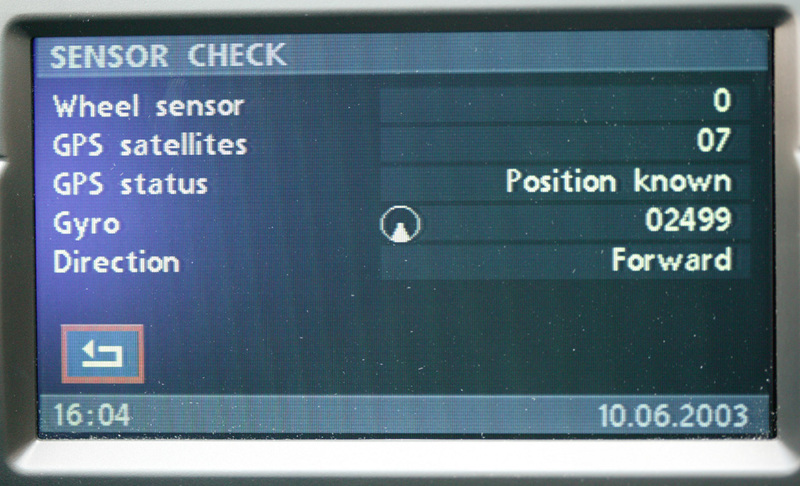 Next we have the receiver status ("position known" in this case) and positioning source (3D/7 means the GPS can "see" 7 satellites and the data is good enough to compute a 3D position. With fewer satellites it is possible to compute a 2D position (latitude and longitude) but not altitide. Last are the PDOP/HDOP/VDOP numbers, which are various dilution of precision values. Lower numbers are better. Consult an introduction to GPS for additional information. 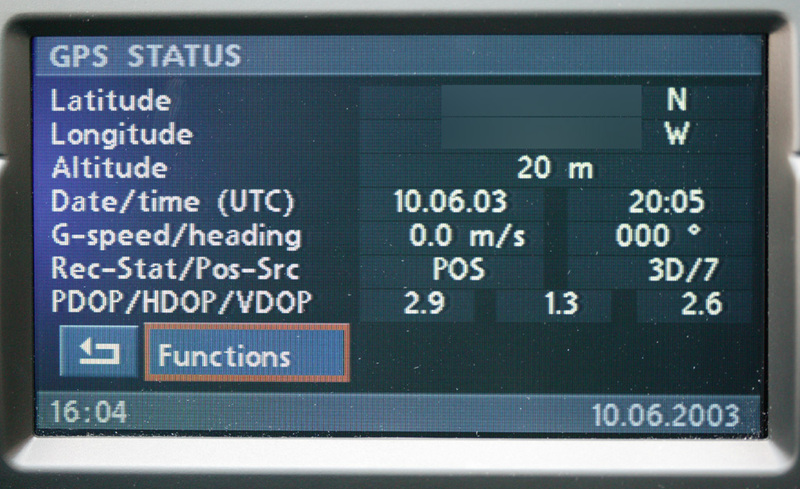 Also, you can see a slight time mismatch between the satellite time and the on-board computer's time. There are valid arguments for either automatically setting the time from the satellite or not doing that. BMW decided to not do it. Lastly we have the actual GPS tracking information. 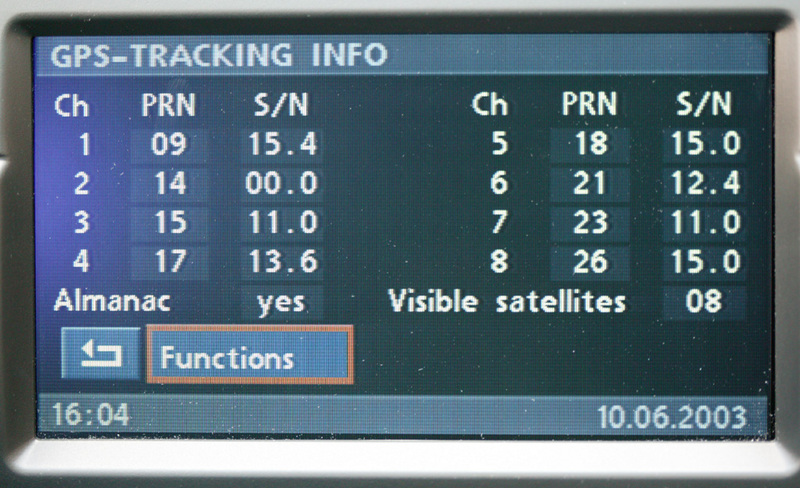 For each of 8 satellites (this is the maximum number the BMW system will monitor at one time), the system displays the internal channel number, the PRN (pseudo-random noise) number associated with a particular satellite being tracked by this receiver, and the signal-to-noise ratio (bigger numbers are better) for that channel. Note that we see no signal on channel 2. 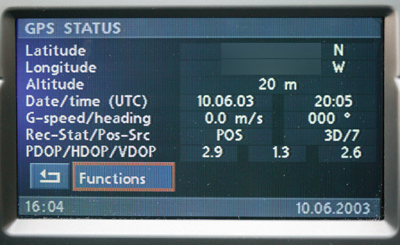 The next line displays the almanac status and a number of visible satellites. This is the number of satellites determined to be above the horizon, according to the almanac. Depending on terrain and other obstructions, the receiver may not have signal from all of these. The two other screens shown above correctly show the number of satellites the unit is actually receiving data from - see the "3D/7" and "07" on those screens. 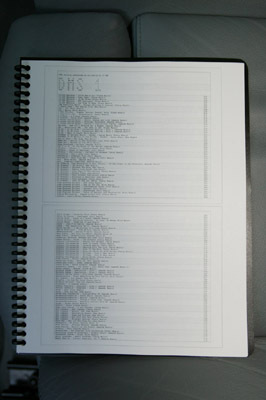 The almanac and ephemeris are data broadcast by the satellites to tell receivers where the satellites can be found in the sky in the future (GPS satellites are not fixed in the sky like telecommunication satellites). The GPS receiver uses this for a "fast start" when rebooted. Without the almanac, the receiver has to search the sky until it finds the satellites. This is why the car won't know where it is when started after the battery dies - it needs to search for satellites and load the almanac data before it can compute positions. The BMW system can also determine gross movements based on inertial guidance, but the error will accumulate and make the system inaccurate unless the position is updated via satellite frequently. 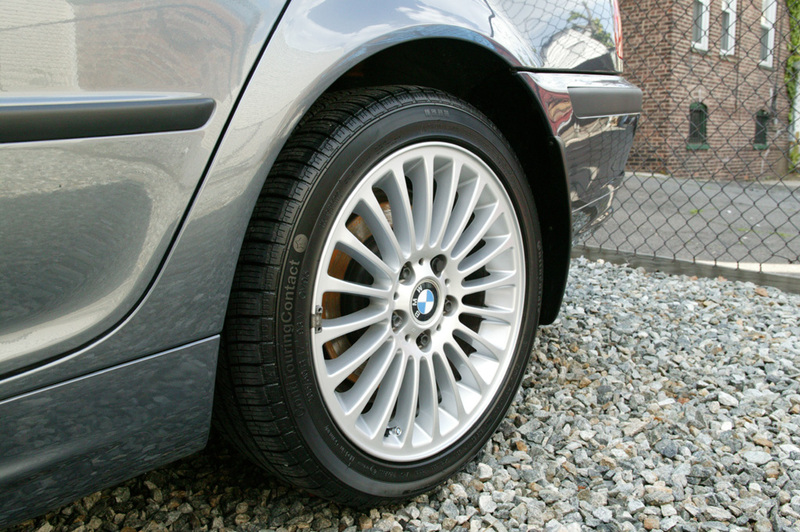 Thanks to David Waller for his comments on my explanation of the BMW GPS system. I have incorporated changes into my text based on his comments. Accessibility Policy This page last modified on Monday, 02-Nov-2015 22:35:34 EST. So, what's a glaver anyway? 30 hits this week, 178029 since 10/6/2002.